HARRISBURG—Rep. Todd Stephens (R-Montgomery) this week honored a fallen Vietnam veteran by remaining a section of Fort Washington Avenue. Fort Washington Avenue between Highland Avenue and Pennsylvania Avenue is now known as the SPC5 George W. Charters, Jr., Memorial Highway. 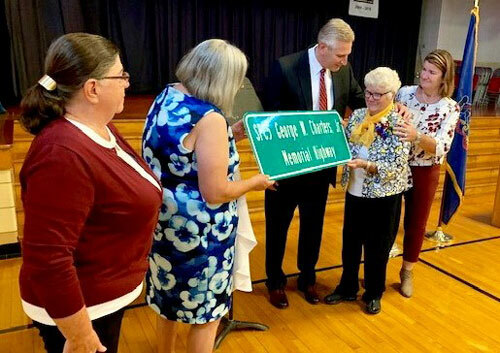 The road sign was unveiled at an event on Saturday. SPC5 George W. Charters, Jr. was born at Abington Hospital on November 8, 1948, the only son of George and Phyllis Charters and a brother to Beth Anne Peirce, Barbara Anne Guest, and Georganne Bruno. He grew up on Park Avenue in Ambler, then moved to Fort Washington at the end of the ninth grade. A 1966 graduate of Upper Dublin High School, he was a lineman on the football team and a member of the Key Club. After high school, George attended Millersville State College and later Montgomery County Community College. In May 1968, he enlisted in the United States Army for a three-year tour of duty and served as a communications system circuit controller with Company A, 369th Signal Battalion, 1st Signal Brigade, 43rd Signal Group. On August 2, 1970, one week into a six-month voluntary extension, George died while serving his country in Gia Dinh Province, South Vietnam. “By remembering SPC5 George W. Charters, Jr with this memorial, future generations will ask who this man was and they will learn of the great sacrifice by young men and women who answered their country’s call to service,” Stephens said. Rep. Todd Stephens presents the memorial sign to the family of SPC5 George W. Charters, Jr.